To access the applet click on the image. The activity will open in a new window. Move the slider to the right and fill in the missing information in the chart. 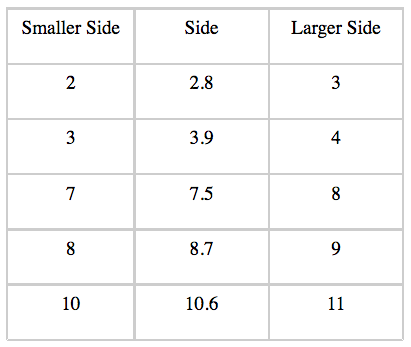 Copy the following table into your notes. Click to see the completed table. Given the area of a square, what does the square root tell you? How do you calculate the area of a square if you know the side length? What does a square root represent? What number, when multiplied by itself, gives me the number I started with? From the table, what is the square root of 64? Use that information to fill in the blanks in the following equation: ____ x ____ = 64. The square root of a perfect square results in a whole number answer. When finding the square root of a number that is not a perfect square, you will often find an answer that is an irrational number. An irrational number is a number that can’t be written as any fraction and will have a decimal that continues forever with no repeating pattern. Other than square roots, one of the most famous irrational numbers is π, pi, which is about 3.14. If you have access to a calculator, you can use the square root button, which on most calculators looks like . Scott is planting a square garden with an area of 40 square feet. Use a calculator to determine the length of one side of the garden. If you don't have a calculator, you will need to estimate the value of the square root. In the following activity you are going to create the squares. You can change the area of the square by either typing it in the blank or moving the black dot on the line in the upper right hand corner. Use the applet to fill in the following table. 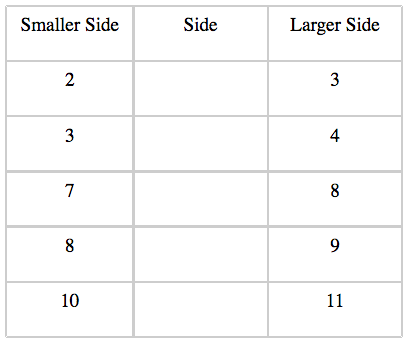 Create a square with the area shown in the middle column of the table. 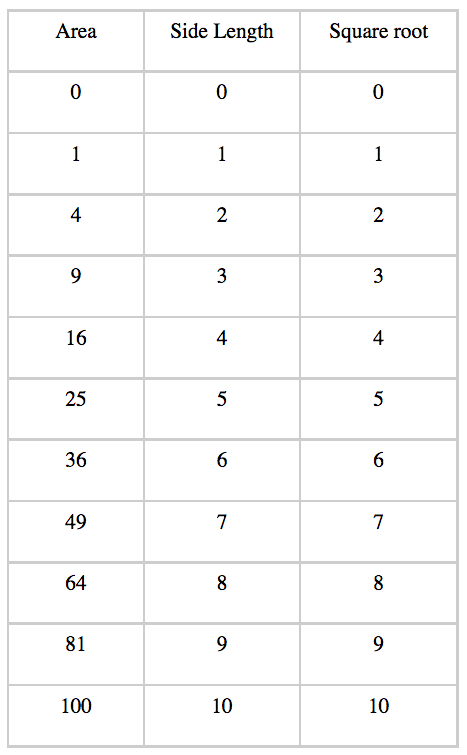 Fill in the first column and the last column of the table with the areas of smaller and larger squares as shown on the bottom number line. 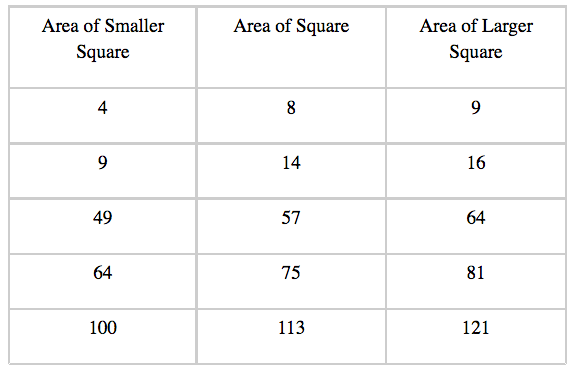 What kind of numbers are the areas of the smaller and larger squares? What does this suggest is a good first step in estimating the value of a square root? 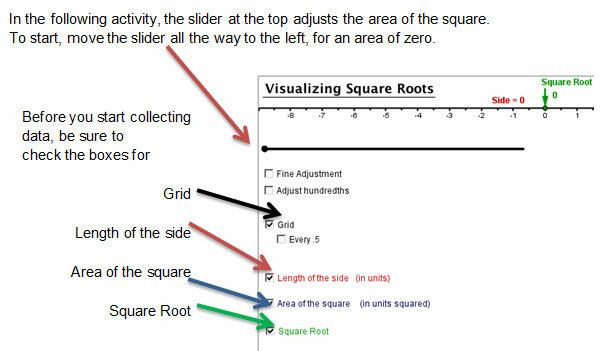 You are going to use the applet again, but this time you are going to find the square roots of the areas of the squares and write them into the following table in your notes. Click to see a partially completed table. What should be true of the square root of the area of the side square in each case? Now insert the estimates for the square roots of the areas of the sides. How did you decide what the decimal should be? Watch the following video clip reviewing the steps to estimate the value of a square root. What are the steps to estimate the value of a square root? Mike makes a square as part of a model house he is building. The area of the square is 30 square centimeters. Between what two whole numbers would you estimate the length of the edge of the square? 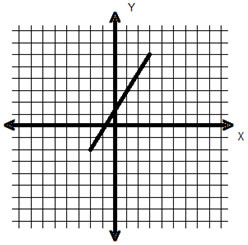 The line segment shown on the following graph has a length equal to units. What is the approximate value of the length of the line segment?